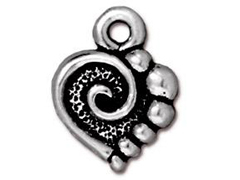 TierraCast® Charms and Pendants are finely crafted of lead-free pewter, made in the USA and plated with precious metals. Adding charms and pendants to your jewelry is a wonderful way to personalize it, whether it’s celebrating a season or holiday, illustrating your favorite hobby, or sending a message about your favorite cause. INM Crystal has a wide selection of TierraCast® charms and pendants in antique silver and gold, oxidized brass and black finishes, to help you add interest and timeliness to your designs. This product was added to our catalog on Wednesday November 08, 2006.
like the design detail.. a little smaller than I expected. ..